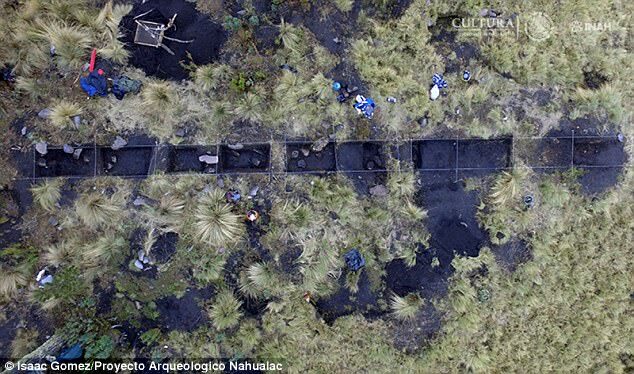 Mexican archaeologists say they have excavated a stone sanctuary in a pond on the side of a volcano east of Mexico City that may have been built as a miniature model of the universe. 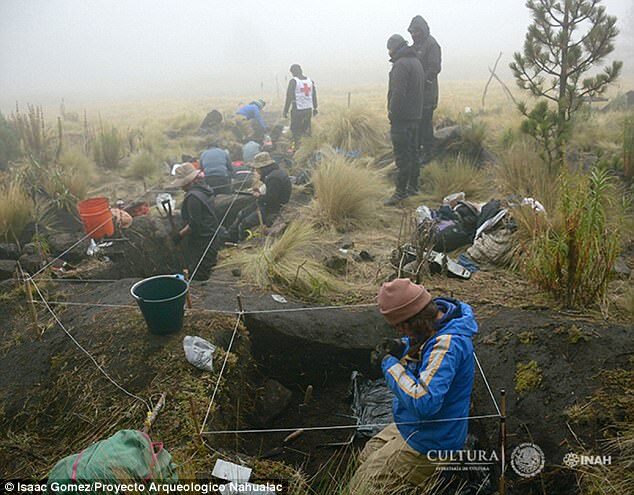 The National Institute of Anthropology and History says the remnants of the stone 'tetzacualco' were in the center of a natural pond below the Iztaccihuatl volcano at an elevation of nearly 13,000 feet. Researchers believe the stones were designed to appear to 'float' on the surface of the water to signify a Mesoamerican myth about the creation of the world that says Cipactli (the monster of the earth) floated on the primitive waters, and from his body the sky and the earth were created. 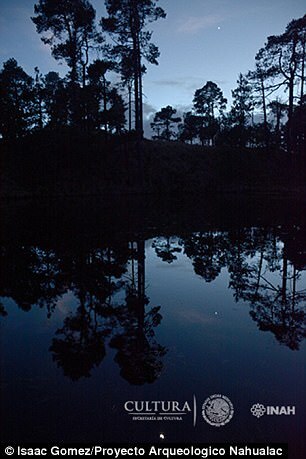 The remnants of the stone 'tetzacualco' were in the center of a natural pond (pictured) below the Iztaccihuatl volcano at an elevation of nearly 13,000 feet. In addition to the sanctuary, decorative pieces associated with the rain god Tlaloc were found nearby. 'The existence of a tetzacualco (shrine) in the middle of a natural pond and the optical effect that occurs when the water mirrors, from which it seems that the structure emanates, suggests that the place is the representation of a primeval time and space, a miniature model of the universe,' the researchers said. Iris Hernandez, an archaeologist on the projecty, says there suggests that there was a ritual control of water from nearby springs to irrigate the pond in order to cause a visual effect in which it appears that the structure and mounds of stone float on the water surface, which in turn reflects the surrounding passage. 'These visual effects, in addition to the characteristics of the elements that make up the site and the relationship they have with each other, make us suppose that Nahualac could represent a microcosm that evokes the primitive waters and the beginning of the mythical time-space'. 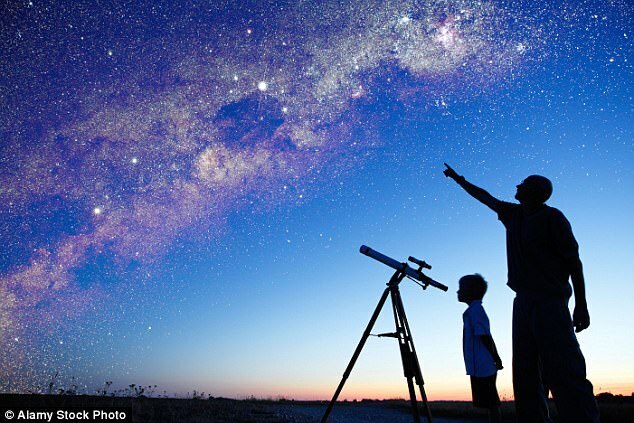 Some Mesoamerican myths about the creation of the world indicate that Cipactli (the monster of the earth) floated on the primitive waters and from his body the sky and the earth were created. 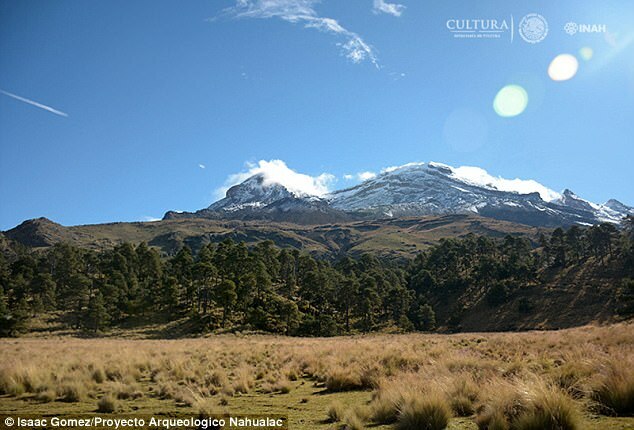 The remnants of the stone 'tetzacualco' were in the center of a natural pond below the Iztaccihuatl volcano at an elevation of nearly 13,000 feet. 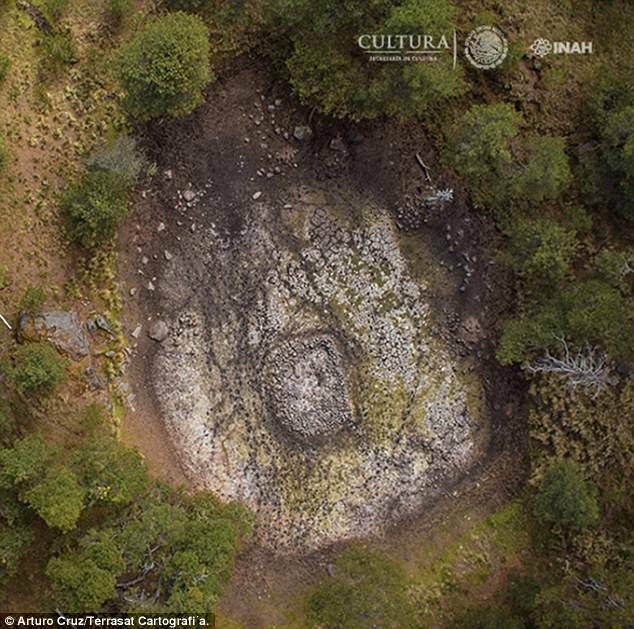 Archaeologist Iris del Rocio Hernandez Bautista says some Mesoamerican creation myths hold that the earth monster Cipactli floated on primeval waters and then split itself, thus creating the heavens and earth. She says the site at Nahualac could show that. The Nahualac pool consists of two areas, archaeologists found. The first and main is a seasonal pond within which a rectangular temple of stacked stones without any type of cement known as tetzacualco (11.5 x 9.8 meters) was built in pre-Hispanic times. 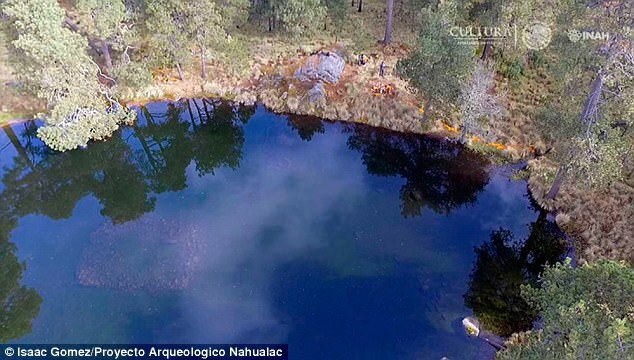 The stone sanctuary in a pond on the side of a volcano east of Mexico City may have been built as a miniature model of the universe. The second area is located 150 meters southeast of the structure, over a wide valley where springs appear. 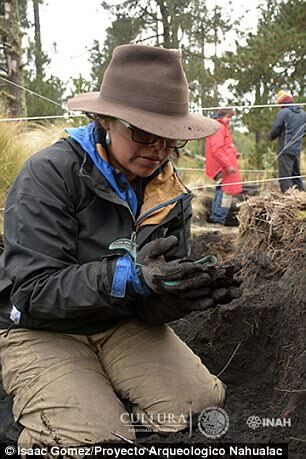 The team has found ceramic pieces with decorative elements associated with Tlaloc, deity of the rain, in the area. 'In this area, ceramic materials were identified on the surface, some of them identified as Coyotlatelco (750-900 AD), Mazapa (850 to 900 AD) and Tollan Complex (900-1150 AD). Altogether, the mini model covers an approximate area of ​​300 by 100 meters, the team said. The materials are currently being analysed, and include small blades, fragments of slate artifacts and objects of gray and pink shale. There were also several tripod bowls arranged as an offering.